This plastic riverbank protection is rot-proof and as a result guarantees a longer useful life than the hardwood alternative. The material for bank protection can be re-recycled several times. As compared with the use of hardwood, the environmental saving is considerable. For every kilometre of riverbank protection, 25 trees no longer need to be felled and 22 tonnes of CO2 emissions are avoided. ARN are specialists in the reuse of materials from cars. The eventual goal of the organisation is to reuse all material from cars. There is however still around 5% residual product. 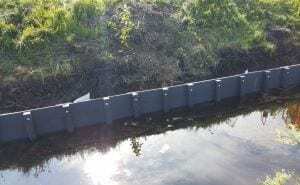 To help reuse this residue a product has been developed, together with a manufacturer of thick-walled plastic products, that can now be used in the form of riverbank protection. During the pilot, a record will be kept of how the material performs in this riverbank protection application. The material will be tested for a series of characteristics including strength, durability and susceptibility to attack by naturally occurring organisms. The eventual goal is that the material should be a good replacement for hardwood, with a similar value-for-money ratio considering the entire useful life of the bank protection system.